Granel Villach L, Moya Sanz MA, Fortea Sanchis C, Escrig Sos VJ, Fortea Sanchís C, Martínez Lahuerta C, Tornador Gaya N, Salvador Sanchís JL. Primary malignant melanoma of the esophagus is a rare tumor representing only 0.1-0.2% of esophageal malignancies. The goal of the study was to report on the management of a new case diagnosed and treated in our site. A 67-year-old patient presented with dysphagia to solids with no other remarkable history or associated skin lesions. He underwent gastroscopy, which revealed a polypoid mass suggestive of neoplasm in the distal third of the esophagus. Biopsy indicated melanoma with positive immunohistochemical markers S100 and HMB45, and negative cytokeratins and CEA. Computerized tomography (CT) and positron-emission tomography (PET) scans showed no local infiltration or distant metastases. An Ivor-Lewis esophagectomy procedure was performed with regional lymphadenectomy. Postoperative stay lasted for three weeks, and no remarkable postsurgical complications arose. 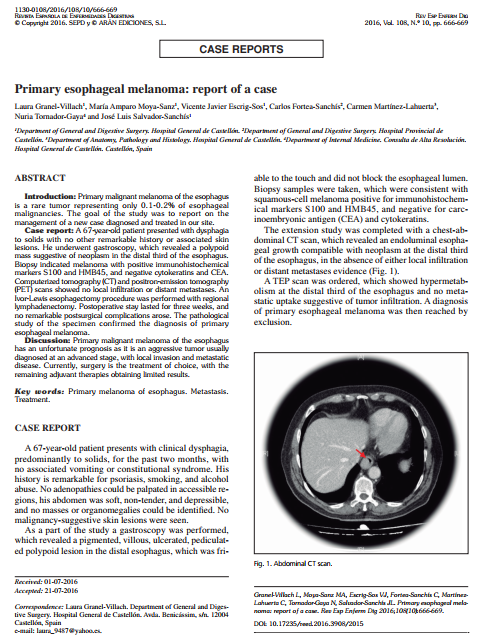 The pathological study of the specimen confirmed the diagnosis of primary esophageal melanoma.